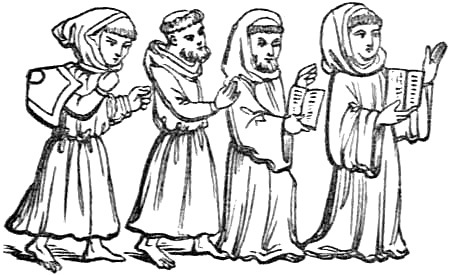 In the later part of the 13th century, a new order was founded in northern Italy. The founder, Gerard Segarelli, was a resident of a town in the territory of Parma. Poor and uneducated, he wished to follow a strict Christian life. He applied to be a Franciscan, thinking that their life of simplicity and poverty was suitable to his spiritual goals. So about 1260, inspired by a picture he had seen of the apostles, he made himself an outfit patterned after that design, sold his house, distributed the money in the marketplace, and became a mendicant, eschewing property, money, a place to live, and anything that might be considered a luxury. He preached repentance, urged the simple life that he embraced, and found many followers. 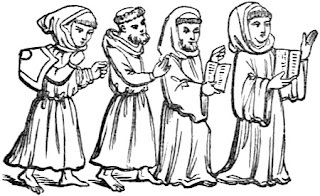 The Apostolic Brethren, or Apostoli, were scoffed at by the Franciscans—they were a little "over the top" in their pursuit of poverty and simplicity. But this was not to last. Tomorrow I'll tell you how Segarelli's dream ended, only to be remembered over 700 years later in a literary bestseller. 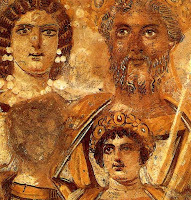 Yesterday we introduced Magnus Maximus, a general who briefly became ruler of much of the Western Roman Empire. 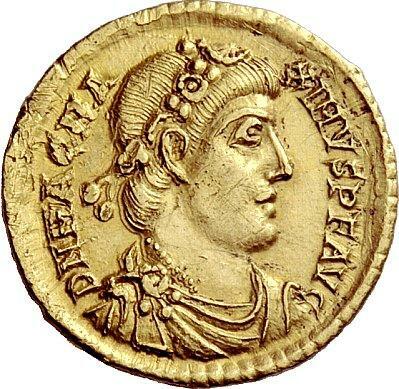 Leaving the young Emperor Valentinian II in Rome, Maximus ruled over Britain, Gaul, Spain, and Africa. He did things that did not sit well with his constituents, however. He is believed to be the first person to order execution for heresy when he executed Priscillian and six followers. 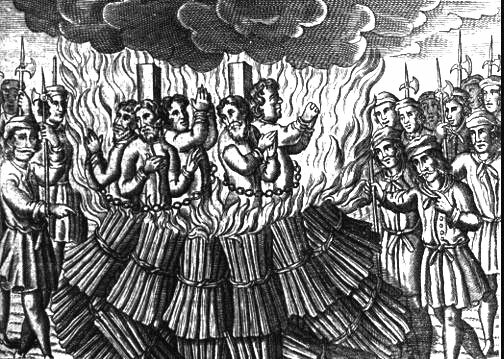 * We are so used to thinking of the Middle Ages killing heretics that we would be surprised to know that this wasn't always common. In this case, St. Martin of Tours (mentioned here) tried to prevent it. 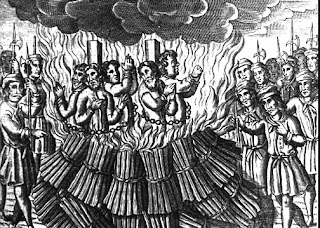 On the other hand, when Maximus tried to censure Christians for burning down a synagogue, Bishop Ambrose of Milan condemned Maximus' decision. Maximus also pushed his luck by driving out Valentinian II, who later, with the help of Eastern Emperor Theodosius I, returned and attacked Maximus, defeating him in 388 at the Battle of the Save (near modern Croatia). Maximus surrendered to his enemies at Aquileia; despite pleading for mercy, he was executed. Later historians did not forget the story of a warrior starting in Britain and conquering Rome. They embraced him, and wove him into England's greatest legend. Accordingly, one of his grandsons was Flavius Ambrosius Aurelius, who had a son, Ambrosius Aurelianus. 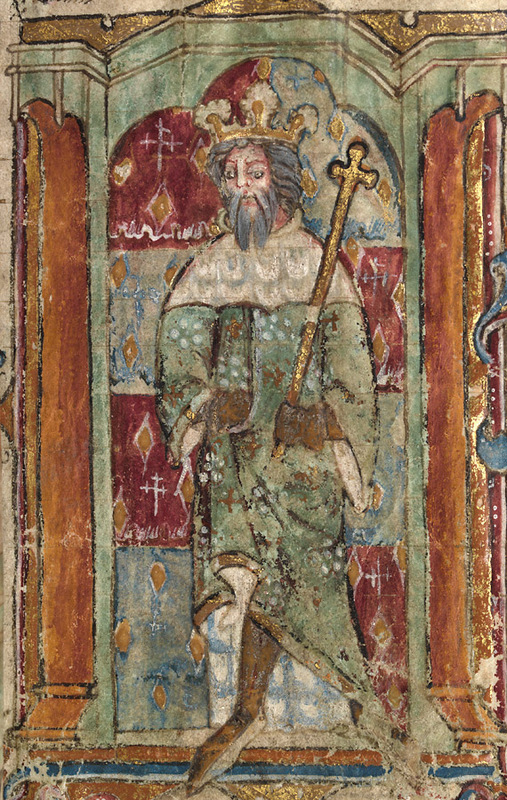 Depending on which ancient historian or modern author you pick, Ambrosius is either the uncle of King Arthur or is the figure on whom King Arthur is based. *"Priscillianism" will be covered in the near future. Yesterday's post featured a picture of the chapel of Saint Illide, belonging to the Château d'Alleuze. The chapel was built in the 12th century and named for a 4th century bishop of Clermont, France. Given that the picture yesterday showed a no-longer-used stone building, you can assume that the stained glass window to the left is not from there. It is found in the Church of Saint-Eutrope in Clermont-Ferrand. The bishop, alternately known as Illidius or Allyre, is credited with helping Clermont-Ferrand become an important center of monastic culture and religious teaching—probably one of the reasons it was chosen by Pope Urban II for announcing the First Crusade. Illide supposedly cured the daughter of Emperor Magnus Maximus of Rome. His reputation earned him praise from Gregory of Tours. The picture below was posted on Facebook a few days ago by a long-time friend. (That's his daughter seen to the right of it. Hi, Kyrie!) It is the chapel of St. Illide. As interesting as the chapel is, however, I want to talk about the castle on the hill behind it. 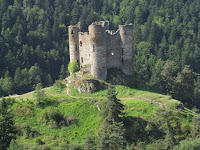 The Château d'Alleuze was built in the 13th century in south central France, looking down on the commune of Saint-Flour. Saint-Flour is named for Florus of Lodève, reputedly the first bishop of Lodève who came to Christianize the area in the 5th century. One of his acts was to strike a rock with his staff, bringing forth water from a spring. 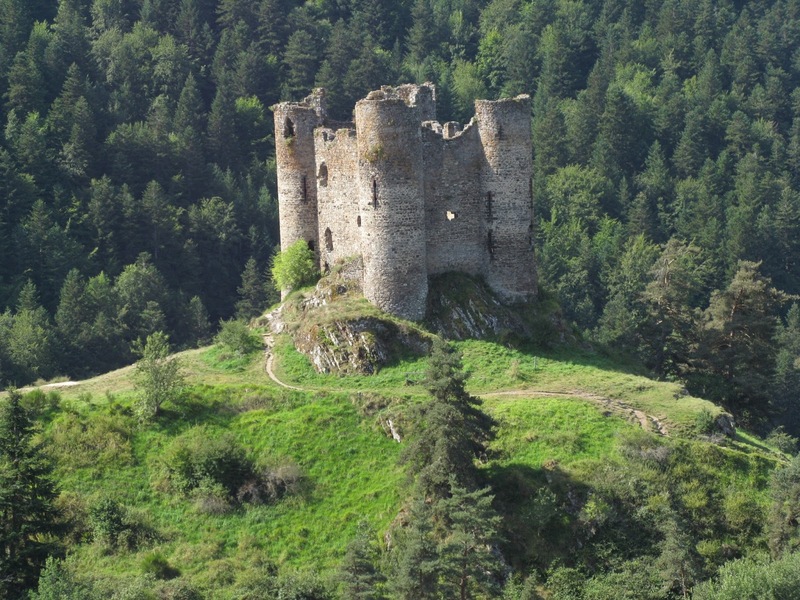 The Château d'Alleuze was built in the 13th century and owned by the bishops of Clermont. Typical for the time, it was built square with round towers at each corner. During the Hundred Years War, it was seized by the Breton Bernard de Garlan, who spent seven years terrorizing the area. The locals burned down the castle in 1405 to prevent it from being used as a base for future terrorism. This understandably annoyed the actual owner, a Monseigneur De la Tour, who made the locals restore it to its original state. It survived for centuries afterward, being used for, among other things, a jail by the bishops of Clermont. A ruin now, it was declared in 1927 as an historic monument, and a recommended tourist spot. The wren, O the wren, is the King of All Birds. On St. Stephen's Day he got caught in the furze. So goes a medieval carol. But why would the diminutive—though disproportionately loud—wren be the king of all birds? The Christians of the Middle Ages had a story for that. God, wanting to know which bird was the king, challenged them all to a contest. Whichever could fly the highest and farthest would be declared king. They all set off, flying until they dropped from weariness. When the eagle was left, and started to fail, the tiny wren popped out from where it was hiding under the eagle's wing, and won the competition. Cute, but it looks a little contrived after the fact. Why would the wren be considered king, and therefore need a fable to justify it? And why is it important that it got caught in the furze (gorse) on 26 December? A traditional St. Stephen's Day pursuit is to hunt the wren, kill it, and bury it. The is sometimes still done in England, although these days it is pantomimed with an artificial bird. The Norse story is that the wren betrayed St. Stephen, leading to his martyrdom; hence the hunting and killing of the wren on his feast day. 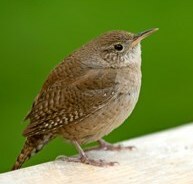 There's an older Celtic connection of the wren with the past year; in the Netherlands its name means "winter king" because the European wren sings through mid-winter. The hunting and killing, then, is probably symbolic of getting rid of the old year to make way for the new. Its "kingship" in European/Celtic tradition likely stems from this tendency to keep singing its surprisingly loud song when most other birds have disappeared to warmer climes. The Plague, also called the Black Death, spread across Sicily shortly after the arrival of a fleet of a dozen Genoese galleys bringing goods from the far eastern end of the Mediterranean. This was in October of 1346. A few months later, in January 1348, galleys from Kaffa (in Crimea) reached Genoa and Venice, where outbreaks also began. The rest of Europe might have been spared—crossing the Alps would be difficult for the Plague carriers—but one of the galleys was driven away from Italy and found shelter in the port of Marseilles on the southern coast of France. That was the real introduction to continental Europe, after which there was no stopping it. There is plenty of information about the Black Death to be found online—including in the blog—so there is no need to go into details here. There is, however, a specific event related to the Plague that took place on today's date. Many populations throughout history, unhappy with their lot, either due to general difficulties or tragedy, have looked for a scapegoat. That scapegoat often takes the form of other people who can be labeled as "outsiders" who are not us and whose presence or actions are hurting us. In the case of the Plague, that scapegoat in many locations was the Jews, who were persecuted and killed, accused of poisoning wells (despite the fact that they drank from the very same sources of water), or of general wickedness that had brought down the wrath of God. 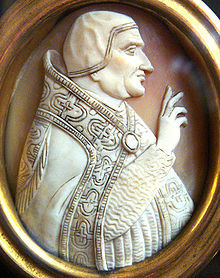 Pope Clement VI was moved to produce a papal bull, Quamvis perfidiam, defending the Jews against the accusations, and urging his fellow Christian prelates to defend them in their territories. It was released on 6 July, 1348. Unfortunately, persecution persisted, and so he re-issued it on 26 September.